Play by Play Day by Day with Amy Lawrence | My unconventional, unique, always passionate take! As the United States marked its 242nd birthday, a news report from the other side of the globe led me to contemplate independence in a way I never have before. In Saudi Arabia, women are now legally allowed to drive. The law was officially changed this summer, so women can finally get behind the wheel themselves and hold jobs that require driving. Several universities are offering classes to teach women how to drive. For the first time in Saudi history, females don’t have to rely on their husbands, brothers, fathers, friends or car services to run errands, go to work, and travel. Amazing! It’s wonderful to see pictures of women in the front seat with huge smiles on their faces as they revel in their new freedom. And that’s what gave me pause: “new” freedom. As the Saudi kingdom became the last nation in the world to lift its ban on female drivers, I started to consider what my life would be like if I couldn’t drive. It wouldn’t remotely resemble what I have today. I wouldn’t be pursuing a career in sports radio, my passion for more than 20 years. Truth be told, I can’t imagine NOT having a car and a license. I’m incredibly thankful for this legal right that allows me to stay independent. I can still clearly recall driving lessons with Mom in Concord, New Hampshire, before I turned 16. Since I played softball in the spring, I couldn’t take driver’s ed until a few months after my birthday. But Mom was determined to teach me how to navigate in the snow so we started early. She put me behind the wheel of our Nissan Sentra (stick shift) and told me it would get easier the more I practiced, ha. Thanks to her, before I ever took my official test, I was comfortable in the driver’s seat. Little did I know, those days were the foundation for a beautiful relationship: me and the open road. Mom was tired of serving as taxi driver for me and my brother, so she instantly handed over the keys when I obtained my license. And I was immediately in LOVE! The road, the radio, the control, the FREEDOM to come and go on my own–it was my personal revolution. Not long after that, road trips became the norm. The next year, our family trekked from New England to Disney World for spring break, and I was thrilled when Mom let me drive. When she let me take the car, I drove to and from college in Harrisburg, Pennsylvania, and then Syracuse, New York. While I was in school, I spent three weeks in the British Isles with a group of fellow students. One of my favorite memories is driving us all over Ireland–opposite side of the road and opposite side of the car! No one else would try, but I was fearless behind the wheel. I wanted the keys, and nothing’s changed since. When I secured my first “real” job in Rochester, New York, I frequently drove east to get back home or west and south to visit Grandma in Ohio. We didn’t have a lot of money, and I certainly wasn’t earning much in local radio, so my first four vehicles were all hand-me-downs. I was extremely grateful for no car payment and great gas mileage! Two Sentras, one Plymouth Reliant, and one LEMON of a Honda Accord. They weren’t fancy; they all had a bunch of miles on them. But they might as well have been chariots of gold. In 2003, I bought my first new car: a light blue Saturn ION with only 6,000 miles on it!! I saved for months, and I chose carefully. Mom took me to Cleveland for a test drive and then to sign the papers before I drove her off the lot. I named her Dixie, and she was a huge blessing. 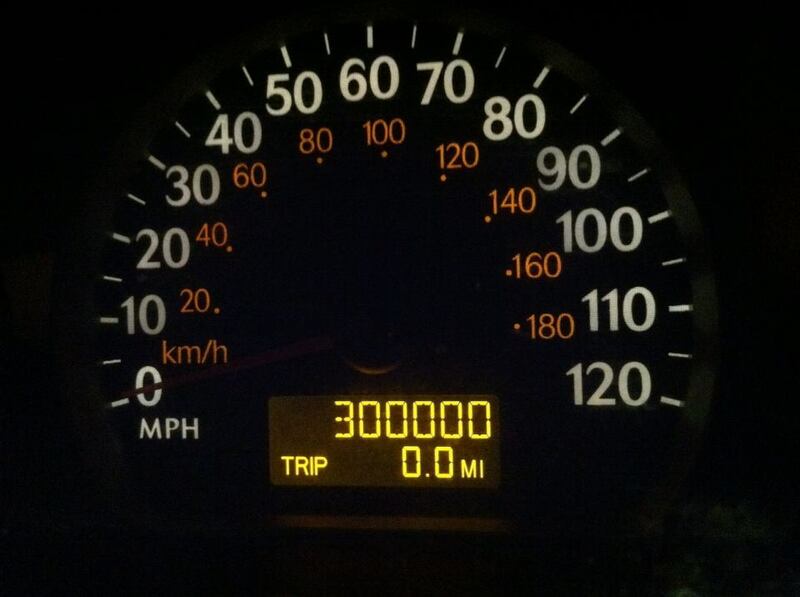 In ten years, I put 300,000 miles on that car (and captured the milestone on camera)! We fearlessly crisscrossed the northeast and the midwest, and I couldn’t have asked for a more reliable companion to get me through a decade of transition in my career. It wasn’t until I accepted the job with CBS Sports Radio in Manhattan that I let her go. I would’ve driven her another 100,000 miles with a bumper held on by duct tape and “racing stripes” from a cab who side-swiped me, except a stick shift in New York City traffic is the opposite of practical. It was easier to give her up when we found a police officer’s family who needed another vehicle. Dixie was a gift from heaven, and I prayed she would be as big a blessing to them as she was to me. Of course, Mom came through again! This time, she gave me her 2002 Infiniti when she moved to Houston. In four years, I racked up more than 100,000 miles on the car, more than she logged in a decade. Isabella (Mom’s choice) was perfect for a city commute and weekend trips to DC to visit my nearest family members. With a career that requires chasing all over the country, it’s always been my car and the ability to drive that keeps me connected to the people I love. The Infiniti carried me safely to and from Connecticut for more than two years while I tried to sell my house. It’s also the first vehicle that I took all the way to Texas for Christmas vacation. So much fun–mostly because I could bring my dog with me! Early July marked one year with Princess Leia, my Subaru Forester. I still can’t believe I get to drive her every day. She’s the second new car I’ve ever purchased, and I want to take her everywhere! So far, we’ve been to DC numerous times; to Western New York to visit friends; to Ohio and Houston (again) for family outings; and to South Carolina for a near-perfect beach vacation. I don’t mind flying when it’s required, but driving is a tonic. What does independence mean to me? It’s the freedom to pursue the career of my choice. It’s the freedom to live on my own. It’s the freedom to travel so I can see family and friends. All of that is possible because I can get in my car and GO when and where I want. I’m so thankful for my independence as an American woman, and I’m thrilled women in Saudi Arabia can now taste some of the same freedom. The summer of 2018 won’t look like any other in my past. It’s not because I’m traveling outside the United States for a missions trip. This is actually my sixth one in the last decade. It’s not the destination either since this will be my third consecutive summer working in Havana, Cuba. No, this July will be different because someone put me in charge!! Whaaaaat?? It’s true! For the first time, I will LEAD a team on a trip outside the country. It’s challenging enough to prepare for an international adventure when I only have to worry about ME; but this year, I’m responsible for making sure a group of six is ready to go. From the recruiting to the incessant emails to the paperwork to the plane tickets–it was a LOT to juggle for six weeks this spring. But with the team committed and our flights secured, we’ve set our sights forward! Time to plan a daily schedule (as much as possible) and put together our packing lists because it’s coming up FAST! I’ll admit I’m slightly overwhelmed by everything that needs to be done between now and departure. None of the young women making the trip has ever been to Cuba before; and for all but one, it’s the first time they’ll serve in another country. As the leader, I want to prepare them by telling them as much as I can about the past two summers. It’s also important to get the six of us together for team-building (easier said than done, ha). Once we arrive in Cuba, I’m accountable for money, meals, lodging, transportation, communication, and the safety of our group. In Havana, that can be more complicated than it sounds. Americans in Cuba are still relative oddities to many locals; but most importantly, we don’t want to attract any extra attention from government officials. We want to avoid undue questions about why we’re visiting, and we also want to protect the church with whom we work all week. I can feel the burden of responsibility as the trip gets closer, especially since I know I won’t be able to ask for help or guidance once we leave the United States. Every time the doubts begin to swirl and I wonder if I can juggle all the tasks as leader, I’m reminded why I accepted this challenge in the first place: it was an answer to prayer! 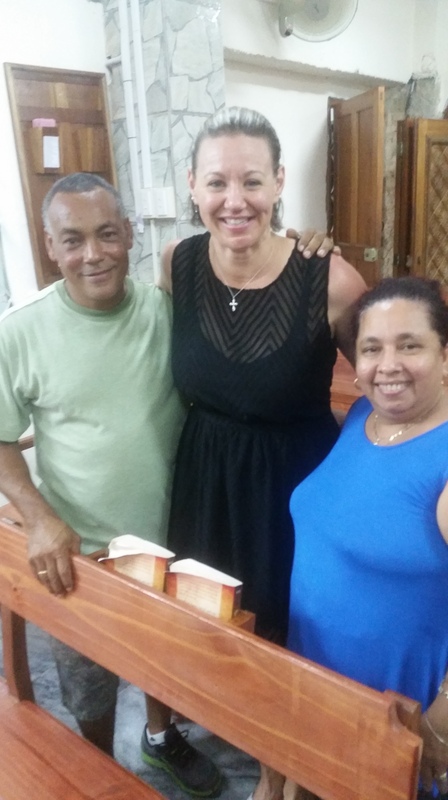 When I returned from last year’s adventure in Cuba, I asked God for the chance to do more. I’ve learned so much from my missions trips the last 10 years, and I realized I shouldn’t be keeping it to myself. So it’s not an accident or coincidence that I was asked to lead. It’s also not a mistake because God doesn’t make those. Instead, it’s an honor to share the wisdom and experience, the highs and lows, and the incredible blessings from my previous visits to Cuba, Mozambique, and Ecuador. My heart swells with gratefulness at this opportunity. My team of young women, ages 16 to 25, is so enthusiastic and full of great anticipation for what we’ll see and do. When the weight of decision-making threatens to drag me down, their energy and spirit lift me up. They remind me to be excited for what lies ahead: for another chance to see the little Cuban church that I love so much and for the time we’ll have to teach and share with the young people. Once again, our team will be participating in Youth Week! The church invites all kids and teens in the village to attend over several days. Generally, there’s a combination of services, music, small groups, food, and games. Oh the games!! They’re fantastic and extremely competitive, and we Americans get to play, too! The pastor in Cuba recently sent me the theme for the week, so the team is busy brainstorming lessons, arts and crafts, even a song we can sing in Spanish. We’re also collecting donations and gifts to take with us! This is one of my favorite parts of the journey. Over the past two summers, our groups have packed clothes, shoes, medical supplies, and books with us to Havana. Last year, I lugged soccer balls and other sporting goods, vitamins for all ages, murder mysteries, and 50 pounds of diapers. It was like Christmas in July–awesome! No trip is ever the same; the itinerary is always fluid when traveling to a country where communication is limited and difficult. Flexibility is necessary always! 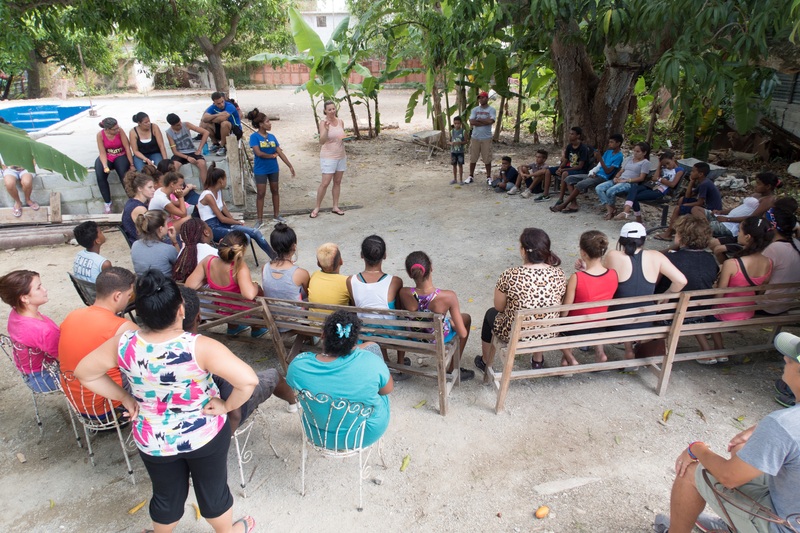 On two separate occasions last year, we went to bed dreaming about a field trip to the beach the next day, only to find out transportation for the youth group and church families had fallen through. In the middle of the night, we were awakened by banging on our doors to let us know the plan had changed–that we shouldn’t show up at the church at 4am, ha! As much as I’d like to prepare the young women on my team for every possible scenario, that’s not realistic. Instead, we must expect the unexpected and accept that we can’t control our schedule or our daily routine. Things happen! But there’s definite freedom in letting go of the illusion of control. GO and SERVE and TEACH and SHARE are among my favorite action verbs. These trips outside the US are the perfect opportunities to get involved and make a difference. And this year, I will add LEAD to the list. My desire is to encourage, support, motivate, reinforce, sustain, reassure, assist, validate, and confirm. But above all else, I need to watch, listen, and pray. I can’t wait!! The thought popped into my brain right in the middle of a recent radio segment. If your MESSAGE is getting lost in your METHOD, are you achieving your purpose? Or can tweaking your METHOD further promote your MESSAGE and move you closer to accomplishing your goal? It’s an interesting concept to consider, whatever the arena or the audience. No matter the point or principle, standard rules of engagement apply to any attempt at communication. I first had my epiphany in the midst of a discussion about National Anthem protests before NFL games. After a weekend in which 12% of NFL players knelt, sat, or stretched during the presentation of the flag and the Anthem, the debate reached a crescendo. Despite the original goal of bringing attention to social injustice and racial inequality, the focal point remains the chosen practice of protesting–on a football field during a moment meant to honor our nation. Regardless of how many times athletes indicate their protest is not against the military, scores of people can’t get past the where and when these demonstrations are taking place. Their MESSAGE is largely getting lost in their METHOD. Is their method wrong? No, not as long as their employer, the National Football League, allows the peaceful protests and individual expressions on the sidelines before games. Since the NFL is allowing players to exercise their free speech, they’re allowed to call attention to causes as they wish. But they can’t control the response. Freedom of speech is NOT freedom from consequences. With thousands of Americans put off by the way they’re protesting, their message is often glossed over in the uproar. What if linking arms during the Anthem results in fewer fans tuning out and still highlights the players’ convictions? If the goal is to spread the word and engage more people in conversation, a compromise may open additional doors. Compromise is often considered a dirty word, as though it undermines principles or waters down messages. But compromise is critical to successful communication, whether we’re talking about mass media or interpersonal relationships. The term “radical middle” was coined in a recent tweet by former Green Beret and Texas Longhorns long snapper Nate Boyer. It immediately piqued my interest, and I started mulling it over. Whether we’re right or left, up or down, forward or back, the easiest place to share ideas is always in the middle. If I take a few steps toward you, and you take a few steps toward me, it’s a shorter journey for both of us. The METHOD of meeting in the middle typically ensures the MESSAGE will reach more people. Very often, compromise is saving us time and money! One major key to fruitful communication is knowing your audience. Understanding WHO is paramount in understanding HOW. As a long-time owner of pets and teacher of kids, I’ve learned it matters far more how I speak to them than which words I use. My Australian shepherd, Penny, is extremely sensitive to my tone of voice. The second my voice belies tension or stress or anger or frustration, she picks up on it. If I get road rage while we’re in the car, she reflects my emotions. The opposite is also true: I can complain about how tired I am and how much I’d rather be sleeping instead of walking her, but if I use my sweet voice, she wags her tail and follows me. It doesn’t matter what I’m saying since she only recognizes a handful of words. My method of speaking to her is far more important than my particular message. The same applies to children. They may only understand part of what I’m saying to them in Sunday school or after a community soccer game. But a voice full of kindness, caring, compassion, and happiness speaks volumes. Again, HOW is more important than WHAT. As a Christian, I relish opportunities to share my faith. I desire to tell people about my relationship with Jesus and how it’s changed my life for good. Of course, I want to convince people He’s real, that the Bible is the living, breathing Word of God. But if I start with, “You’re wrong, and I’m right,” no one’s going to listen to my reasons why. I can scream, yell, preach, shout, tweet and blog about heaven and hell until I’m blue in the face. If my MESSAGE isn’t conveyed with peace, joy, humility, and thankfulness, then it’s lost in my METHOD. And if people are tuning out because of my delivery, what’s the point? My story is one of grace and mercy, forgiveness, redemption, and unconditional love. If I don’t start there, my testimony likely falls on deaf ears. This Thanksgiving, I finally get quality family after months of not seeing them. I’m thrilled for a holiday break full of the people I love most in the world. But if your family gatherings are anything like mine, there is always potential for arguments and conflicts. The people who know us the best know our triggers, our histories, our old hurts and past failures. And with family, we’re not necessarily on our best behavior. I go into every holiday pledging that I will NOT take the bait, ha! That means watching my tone of voice and my sarcastic comments. Family time is precious. Who cares if I’m right or I “win”? Getting defensive and edgy and raising my voice are methods that never work. Way smarter to breathe and let my heart rate subside before I speak. A bull in a china shop usually ends up making a mess. As a passionate, emotional girl, I feel a consistent tug of war between method and message, between my emotions and words. But over time, I’ve learned that respect is the perfect starting block–whether I’m hosting my radio show, talking politics with friends or relaxing with family. It makes every kind of communication more apt to succeed. Ultimately, respect is a METHOD that guarantees a higher rate of return on your MESSAGE. I’ll be honest–while I was in Havana for 10 days last August, I was pretty sure it would be my one and ONLY trip to Cuba. At least once a day, I told myself I just had to survive the rest of the way and then I’d never go back. I know that sounds harsh, but it’s the truth. It was a difficult trip for several reasons, including the brutal heat and humidity. My church team was outside the majority of each day–shoveling and hauling dirt, playing games with kids, standing in line for meals, preparing for and attending a wedding. The thick humidity sapped my strength and left me exhausted. Even my summer treks to Ecuador weren’t as tough. Of course, I was two miles above sea level in the Andes Mountains most of the time! The heat was only part of my struggle in Cuba. Spending time with the members of a poor village church, hearing their stories and witnessing their oppression at the hands of a Communist government–it broke my heart. The Cubans are essentially prisoners in their own country. The majority of applications for travel visas are denied. Not just once, but over and over. 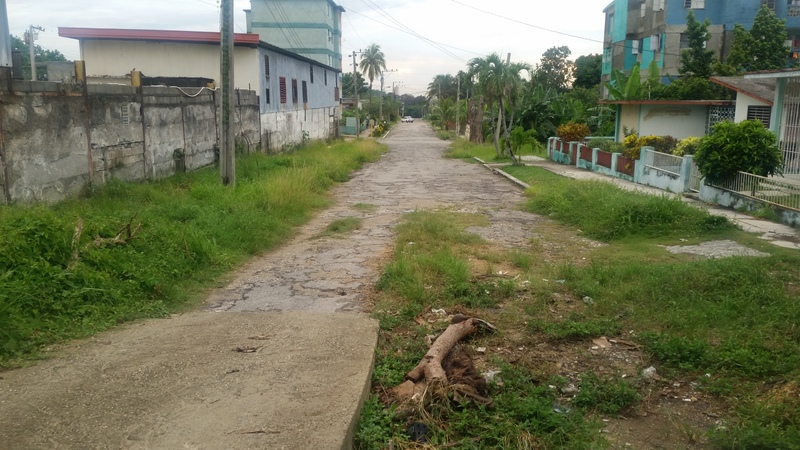 Government officials are petrified the people will get outside the Cuban borders to freedom and never return. For good reason, too, since people risk their lives and families every year to try to escape and defect. The pastor we worked with in Havana told us it’s a huge problem among fellow pastors and priests. 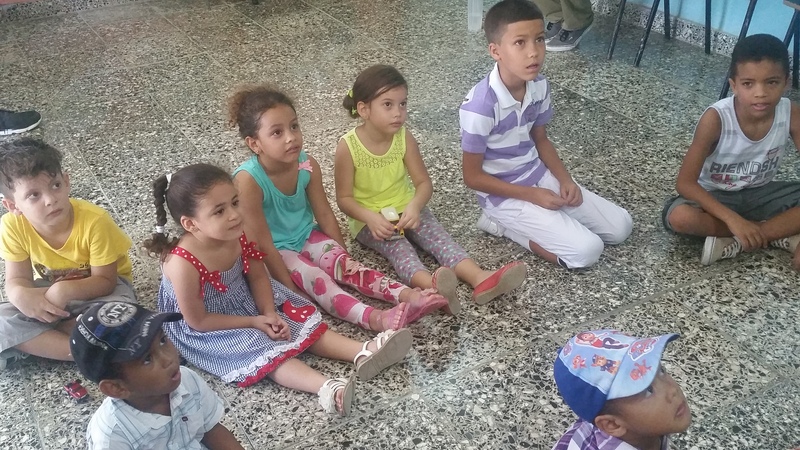 They obtain visas under the guise of education (the Cuban government values education); when they get to the US and other countries, they never go back, even if it means leaving their loved ones behind. With the American travel restrictions lifted, all the extra tourism revenue goes straight to the government. The majority of Cuban locals live in poverty with rations to buy food and old cars that frequently break down. They can’t receive mail or packages from the rest of the world; in fact, most of the homes outside the city don’t even have mailing addresses. The internet connection is spotty at best unless they can find a wifi hotspot in the city streets. How did 10 days make any difference whatsoever?? Sure, I took school supplies, soccer balls, frisbees, and other sporting goods with me last summer. And we left piles of clothes and shoes behind. We gave the Cuban church the extra money we had. We helped to build a pool they also use as a baptismal. We danced and sang and ate with them. But really–what difference did it make? I wrestled with this question many times in the months after my trip. And when a new team formed this spring, I wrestled with it again. No, I wasn’t sure I wanted to return to Havana. I waffled back and forth. I talked to my family. I prayed about it a ton! As it turns out, the 2017 mission will be extremely different from a year ago, though many of the faces will be the same. Ultimately, those are the two reasons I committed to GO again this July. What’s changing?? For starters, we won’t be spending any money to stay in hotels this year. Cuban leaders are closing many of their hotels to Americans. Apparently, they’re worried about the US influence on locals. I’m thrilled we won’t be putting that money in the government’s pocket. Instead, we’ll stay on the church property all week. Five of us women will share a room with bunk beds in a concrete building adjacent to the pastor’s home. The room is often used to house families of villagers who visit from other parts of the island or to assist people in need. We *believe* we’ll have A/C to sleep, but there won’t be any hot water for showers, ha. We’ll be using an outdoor bath house on the property. This year’s trip will resemble my journey to Africa when I was camping in the bush! The ability to bring school supplies, medical necessities, and clothing to the church in rural Havana is another major reason I decided to go back. Since the mail system can’t be trusted, showing up in person is the most reliable way to give them what they desperately need but can’t obtain. Right now, the Cubans have very little access to basic over-the-counter medicines and first aid supplies. According to news reports, even the hospitals don’t have adequate provisions. I’m planning to stuff my suitcase with aspirin, stomach meds, band-aids, gauze, balms, creams, vitamins, and anything else I can think of. I’m thankful to family and friends who are donating money to buy them. I also heard from a listener in Atlanta who’s shipping dozens of first aid kits to me so I can take those, too. It’s the PEOPLE drawing me back to Cuba. After meeting them and hearing their stories, after communicating with some of them via Facebook or email over the last year, I want to see them again. The pastor and his extended family, the dozens of young people who hang out daily at the church (a room off the pastor’s kitchen), some women that I now call friends–they are the most important part of the trip. They are so encouraged by our visits, by knowing that we traveled from our country to spend time with them. This summer, our team will partner with the church on a special week-long youth outreach which is really exciting for me. Teaching elementary school kids gathered on Sunday was a highlight of my 2016 adventure. No doubt the heat and humidity will be excruciating again. No doubt I’ll struggle with sadness as I see and hear about the poverty and oppression in Cuba. No doubt I’ll feel helpless, like I can’t possibly do enough. 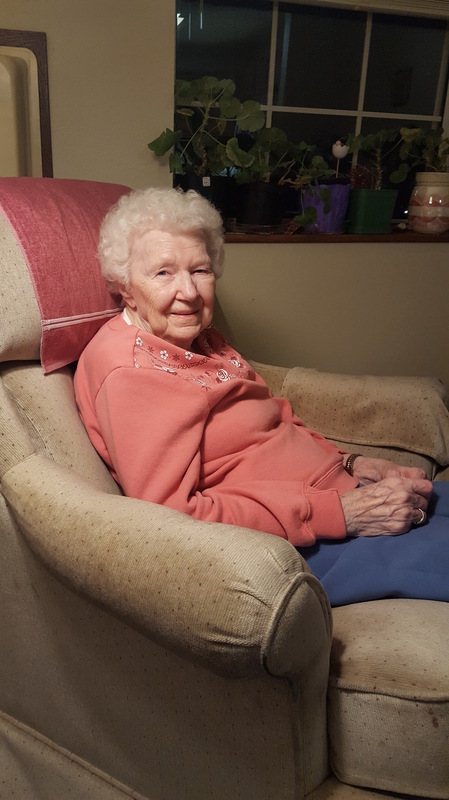 But if our visit makes a difference to THEM–puts smiles on their faces, lets them know they’re loved, meets some of their practical needs–then it’s all worth it. What a great superpower that would be–the ability to click our heels together three times and instantly be transported to the place we call home. For the majority of people, a specific location or picture comes to mind when they hear the word “home.” Maybe it’s the house where they grew up or the city or town where they were raised. Maybe it’s the address where they currently abide. Home can mean a million different things to a million different people. The family nucleus certainly doesn’t look the same or operate the same for everyone. In 2017, the traditional image is more common in the movies than in real life. And that’s not bad. We don’t all have to fit into the same formula, and we definitely don’t all have to come from the same kind of homes. When I first started mulling over a blog post about home, it was the holiday season. I was fresh off a long Thanksgiving weekend with my brother’s family, and I was full of anticipation for Christmas when our whole crew would gather in one place to celebrate, cook, bake, eat (a lot! ), share our gifts, watch movies, and relax together. Since I was born, I’ve never missed Christmas with my Mom, and only once have my brother Matthew and I been apart on December 25th. That holiday is precious to me because of them, even though we very rarely gather in the same place in back to back winters. We rotate from one house and one state to the next. For me, my home is my haven. It’s my retreat from the world and the pressures of being a semi-public figure and hosting a national radio show. It’s where I find peace and calm and rest. At home, I don’t have to entertain the masses. At home, I don’t have to know all the answers or generate new creative ideas. At home, I don’t have to talk! When I withdraw, I can let my guard down. I don’t have to be “on.” I’m not Amy Lawrence at home; I’m just Amy. A few weeks ago, I walked in the door of my house after a rough show. I don’t remember exactly what bothered me, probably some mistakes I made on air. But just like clockwork, my dog and two cats were crowded into the foyer to greet me. Penny was shaking her whole back end (because that’s what Australian Shepherds do), and the cats were happily circling around me since they’re all MORNING PEOPLE!! It dawned on me that no football game, no miscue on the radio, no social media insult was more important than breakfast. That’s what “home” means to me: a refuge that offers perspective and balance, where life is nice and boring. If I published this blog post a month ago, it wouldn’t have included my recent revelation. When I was in Houston for Super Bowl Week, I worked both days and nights. I spent afternoons recording interviews and networking with members of the football and media industries; and I spent nights posted up at our Houston affiliate to host my shows. From Monday through Friday of that week, I didn’t sleep more than four hours at a pop. Instead, I napped whenever I could. It was brutal. What I saw, heard, and experienced made the exhausted effort all worth it; but I was a mess by Friday afternoon when I got to Mom’s house northwest of the city. I finished writing my weekly column about the same time she got home from school. She and her husband wanted to go out to dinner, but I was about to keel over. I took a nap while they went out. Mom woke me out of my daze to eat dinner when they got home; and 90 minutes later, I fell asleep again. Not only did Mom let me sleep 10 hours that night, but she didn’t mind that I took a three-hour nap on Saturday. It was what I needed, and she knew it. That doesn’t happen unless I feel at home. Maybe the word “home” conjures up a specific image or picture in the minds of most people. Maybe the vast majority envisions a singular location. For me, it’s not an address or geography or even the first house I purchased all by myself. At this point in my life, with all its twists and turns and surprises, home is simply where my pets are and where Mom is, wherever those places happen to be.